There are many different types of filters available today for koi ponds which require regular cleaning. The decaying fish waste and pond debris need to be removed from the filter, flushed and cleaned with a garden hose – a labor intensive, stinky, filthy, disgusting job if there ever was one! Biological filters are designed to filter out particulate and organic substances. By utilizing anaerobic bacteria-laden filter media, a bio-filter breaks down harmful toxic substances into harmless by-products. Busy koi ponds without a bio-filter will develop an environment harmful to its inhabitants as a result of the build-up of fish waste, decaying pond creatures and leaves and other debris that have settled to the bottom. The size of the bio-filter used in a koi pond is in direct proportion to the number of fish per gallon. The more fish, the more waste and the bigger the filter that is needed. Do you really need a filter? Not necessarily on the small ones — not if you follow nature’s guidelines. Natural lakes and ponds don’t have mechanical bio-filters and they are home to many healthy fish. If, however, the koi fish begin to overpopulate the lake and start running out of food, they would thin out naturally until the population was small enough to be sustainable by their environment. Such a hypothetical overpopulation would cause an imbalance in the nitrogen cycle by producing too much nitrite from the koi fish waste. Then the increased pH of the water would create an algae bloom that could fill the lake and choke off the koi fish. Man-made koi ponds can be controlled mechanically and chemically to allow for larger numbers of koi fish per gallon than would be found in nature. 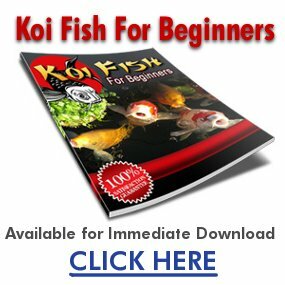 Many formulas exist for dictating the proper number of koi fish a pond can hold, whether you calculate koi fish per square surface foot, koi fish per cubic foot, koi fish per gallon, pounds per gallon, or pounds per cubic foot. The bottom line here is: healthy water equals healthy koi fish. If your water is fish-friendly, the number is insignificant, within reason. If the air were pure, and if you had plenty of food and water, and a healthy way to eliminate, you could live in a small house with 30 other people and stay reasonably healthy, were it not for one thing: stress. Koi fish are like humans in that respect. If it gets too crowded, the koi fish will try to leave the koi pond and some actually do, but they do not get far. If koi fish are jumping out of a koi pond, it is not because they have an exploring nature; the koi pond is either too crowded or the quality of the water is less than desirable. Man-made devices stretch the natural parameters set by nature, allowing the koi pond to support more life than it normally would. The biological filtering system is the best way to accomplish this. The more advanced the technology, the more effective its ability to treat water. There are as many different types and configurations of filters as there are people wanting to get rich off manufacturing and marketing their own filters. Almost every koi pond or water gardening magazine contains more advertisements for filters than any other product. Which one is the best? First, let’s discuss the various types that are available. The most common filters are the up-flow, down-flow, submersible, recycling and pressurized types. The most common problem plaguing the operation of any filter is channeling. Water will always take the path of least resistance. Filters use a variety of filter media or material for the water to pass through. Pond water contains a large amount of suspended matter that collects in this filter media, eventually blocking or plugging the spaces between the material. As this occurs, the water will divert to another available path until it, too, clogs. Eventually, the water flow will find a permanent channel, avoiding the filtration process altogether until the media is removed, cleaned and replaced. In the case of a down-flow filter, it operates on the principle of gravity, as opposed to pressure or up-flow. So when the media begin to clog, gravity is not sufficient to force the water through the available channel at the same rate that water is being pumped through, so it spills out the overflow drain back into the koi pond, unfiltered. The most efficient and maintenance-free filters are pressurized filters that have a backwash feature. A bio-filter contains filter media on which nitrifying bacteria reside, and which break down the toxic nitrites into less toxic nitrates that can be used by the water plants. Consequently, the more surfaces that are available per square centimeter of material, the more effective the filter. Recent technology developed by Aqua Ultraviolet produces special hexagonal beads for their pressurized filters, which possess the greatest maximum available surface area of all existing filter media. They are tapered so that the beads are less likely to group together. Back washing forces water through the filter in the opposite direction, breaking loose solid material and flushing it free down the drain outlet. Or, with the use of a flexible ribbed hose, it will direct the nitrogen-rich waste-water onto the lawn, trees or flowers. Maintenance involves a simple turn of handle for about one to two minutes. Down-flow or upflow and submersible filters require disassembling and washing of all enclosed media, and then returning it to the filter — a very messy and dirty process. Unfortunately, pressurized back-washable filters are costly and are designed for larger projects for use with out-of-pond pumps which are needed to adequately back-wash the filter. Thus, it is necessary to settle for the high maintenance, less effective down-flow or up-flow filters for smaller koi ponds of up to 300 gallons. If you are one of those people who now have, or are thinking about building a small koi pond, I have great news for you! Twenty-five years ago when I started in this business, there were few small pond filters available. However, with the advent of the liner pond in the early nineties, everybody and his brother-in-law started manufacturing down-flow filters in their garage. With no marketing plan, capital, or quality craftsmanship, most all the fly-by-night-by-the-seat-of their-pants back alley filter hopefuls faded out. A filter for a 250 gallon koi pond will range from $160-$200; for a 1000 gallon koi pond, $300-$400; and for a 2000 gallon koi pond filter from $500-$600.